SALTA (Salud Ambiental Lideres Tomando Accion – Environmental Health, Leaders Taking Action) is a web-based, interactive leadership development curriculum that provides community leaders with skill-building training in community organizing, policy advocacy, building power, community health, environmental justice and effective communication. SALTA is a key component to ensuring that EHC achieves our core mission. More than education, SALTA is integrated with EHC’s organizing and advocacy efforts to achieve environmental and social justice. SALTA programs represent the organic educational efforts of the different campaigns, teams, leaders, and staff that make up EHC and were designed specifically for our leaders based on our local efforts. We began SALTA trainings in 1996, and now more than 2,000 individuals have been trained. Developed and field tested by EHC staff and leaders during the past 15 years, SALTA uses a popular education approach that makes the training inclusive and accessible to all participants. Trainings are based on the knowledge, skills and real-world experiences of EHC staff, leaders and training participants. Popular education, which has varying interpretations, is best defined by the practice where participants share their own understanding and feelings about a specific topic or issue and that understanding and feelings are considered valid. The idea of popular education (often described as “education for critical consciousness”) as a teaching methodology came from a Brazilian educator and writer named Paulo Freire, who was writing in the context of literacy education for poor and politically disempowered people in his country. It’s different from formal education (in schools, for example) and informal education (learning by living) in that it is a process which aims to empower people who feel marginalized socially and politically to take control of their own learning and to effect social change. The SALTA sessions improve participants’ sense of belonging to a community as participants and stakeholders of their societies. They begin to see themselves as empowered members who can make change. 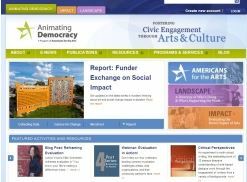 Animating Democracy, a program of Americans for the Arts, has an online storehouse of resources aimed at helping arts organizations evaluate the social impact of creative work that aims to make social change. Although the site is intended for arts-focused organizations, many of the resources offered are applicable to the work of a wide variety of service agencies interested social change work. 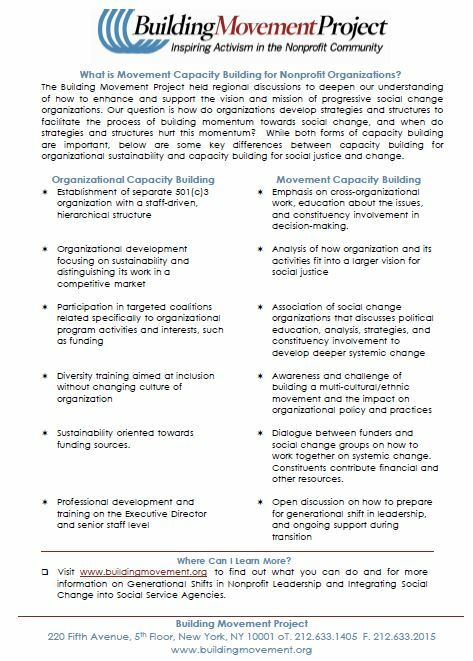 This fact sheet from BMP highlights some key differences between capacity building for organizational sustainability and capacity building for social change. It identifies nine areas identified as important building blocks of social movement capacity for nonprofit organizations. 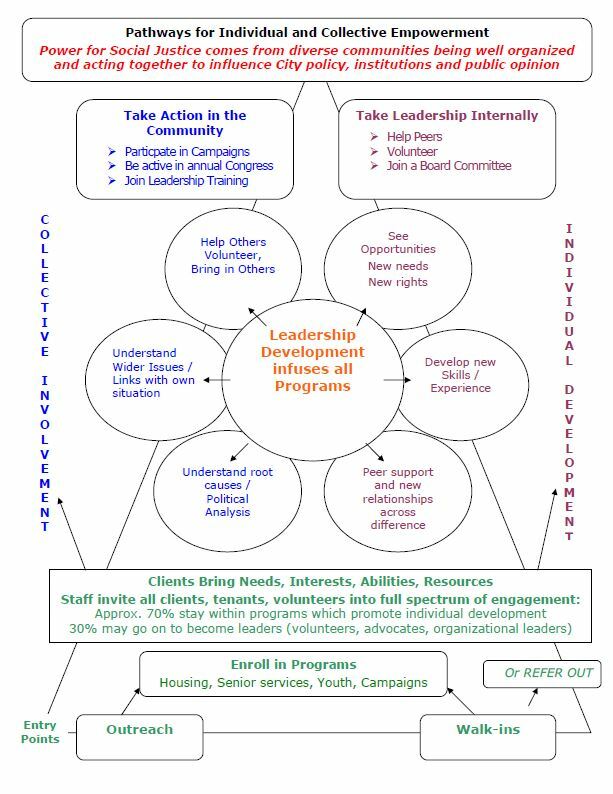 This detailed diagram illustrates how collective involvement and individual development empower social justice actions within a community. It can be used with the organization to measure change across a spectrum to increase understanding of the forces that are driving change and where efforts need to be focused. The Building Movement Project develops research, tools, training materials and opportunities for partnership that bolster nonprofit organizations’ ability to support the voice and power of the people they serve. Funding for this Resource Library was generously provided by the Charles Stewart Mott Foundation.